I would like to thank all of the ladies who supported the competition today at Torwoodlee. We had a fantastic turnout and so pleased to see everyone in high spirits despite the bitterly cold weather. A special thanks goes to Ronnie and his team at Torwoodlee Golf Club for keeping us fed and watered throughout the day and to Robin for assisting with the scoring. Vouchers will be given out once Wilma returns from her holiday. A short note to communicate from the day – could we all please make sure our scorecards are all filled out correctly with 2 signatures and playing handicap. There were a few uncompleted scorecards from the day and this does prolong the scoring process. There was also a Bushnell measuring device found on the 17th fairway and is behind the bar at Torwoodlee if anyone has lost theirs. A ladies, red, Galvin Green waterproof jacket was also left in the ladies changing room and I have that if anyone has lost theirs. Thank you once again for your support and the Championship draw will be published very soon and I look forward to seeing you all again soon. Please find below the draw for the spring competition/championship qualifier. I will still be accepting late entries if required. The Jenny Cleghorn was held today at St Boswells Golf Club with 20 pairs playing which was brilliant and it was lovely to see some fresh faces taking part. If you have not already done so, could you please let me know your up to date handicaps. Our second friendly match was played at Minto today on a mainly dry but breezy day. 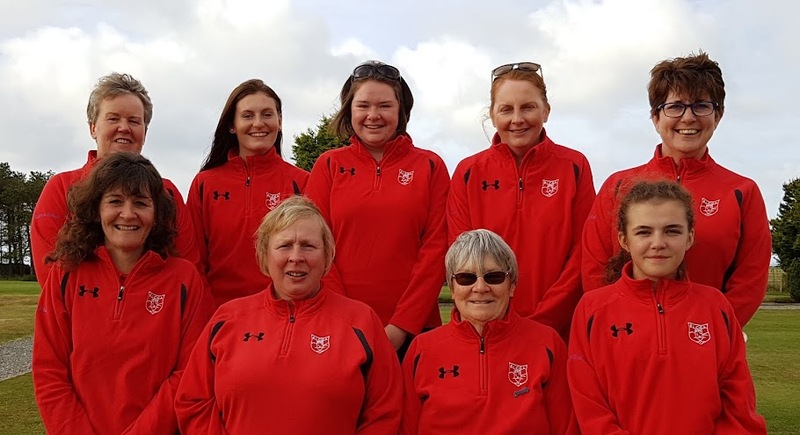 We again played 4 matches of foursomes with East Lothian winning 3 ½ to ½.
June-Anne Clark and Fiona Ker halved match against Kay Lannin and Dulcie Barnes. Thank you to all the ladies who came to play and I hope to see you all at St Boswells for the Jenny Cleghorn. The following ladies have been selected to represent the Borders in the match at Minto Golf Club on Sunday 24th March. Please all players meet at Minto at 10.00AM sharp for coffee and bacon rolls. Dress: Black trousers, Red T-shirt, Red fleece / jumper.